Understanding Bullying Among Children -Why Do Kids Bully? Why do some kids turn to bullying? The answer is simple: it solves their social problems. After all, it’s easier to bully somebody than to work things out, manage your emotions, and learn to solve problems. Bullying is the easy way out and, sadly, some kids take it. Look at men who beat or intimidate their wives and scream at their kids. They’ve never learned to be effective spouses or parents. Instead, they’re really just bullies. And the other people in those families live in fear—fear that they’re going to be yelled at, called names, or hit. I’m not just talking about the adults in the family, either. There are countless children who throw tantrums for the same reason: they’re saying, “Give me my way or face my behavior.” And if you as a parent don’t start dealing with those tantrums early, your child may develop larger behavior problems as they grow older. Ask yourself this question: how many emotional bullies do you know? They usually control others through verbal abuse and insults and by making people feel small. They’re very negative, critical people. The threat is always in the background that they’re going to break something or call somebody names or hit someone if they are disagreed with. Realize that the behavior doesn’t start when someone is in their teens—it usually begins when a child is five or six. Bullying itself can come from a variety of sources. One source, as I mentioned, is bullying at home. Maybe there are older siblings, extended family members, or parents who use aggression or intimidation to get their way. I also think part of the development of bullying can stem from some type of undiagnosed or diagnosed learning disability which inhibits the child’s ability to learn both social and problem-solving skills. But make no mistake, kids use bullying primarily to replace the social skills they’re supposed to develop in grade school, middle school, and high school. As children go through their developmental stages, they should be finding ways of working problems out and getting along with other people. This includes learning how to read social situations, make friends, and understand their social environment. Bullies use aggression, and some use violence and verbal abuse, to supplant those skills. So in effect, they don’t have to learn problem solving, because they just threaten the other kids. They don’t have to learn how to work things out because they just push their classmates or call them names. They don’t have to learn how to get along with other people—they just control them. The way they’re solving problems is through brute force and intimidation. So by the time that child reaches ten, bullying is pretty ingrained. It has become their natural response to any situation where they feel socially awkward, insecure, frightened, bored, or embarrassed. Here is what an aggressive bully often looks like. He doesn’t know how to get along with other kids, so he’s usually not trying to play with them. When you look out on the playground at recess, he’s probably alone. He’s not playing soccer or kickball with the other children. He’s roaming around the perimeter of all the interactions that take place at school on a daily basis. Whenever he’s confronted with a problem or feels insecure, he takes that out on somebody else. He does this by putting somebody else down verbally or physically. 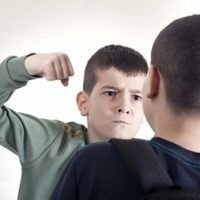 A child who bullies might also throw or break things in order to feel better and more powerful about himself. When the bully feels powerless and afraid, he’s much more likely to be aggressive, because that makes him feel powerful and in control. That’s a very seductive kind of thing for kids, and it’s very hard for them to let go of that power. When we talk about adolescent bullying, we’re entering into another phenomenon altogether when compared with pre-teen bullies. The reality is that many adolescents in high school today are very abusive to each other. There are peer groups that will attack other kids verbally and emotionally, similar to a gang mentality. When these kids start calling other students rude names and questioning their sexuality, it is all done to dominate and bully them. If a teen or pre-teen doesn’t want to be a victim, they have to join a group. The kids who don’t socialize very well—the shy or passive types—often become the targets. And the threat of violence is always behind it. This trend in high school is prevalent today, and I think very destructive. In my opinion, parents and school administrators who ignore the way kids abuse each other in high school are kidding themselves. This behavior is hurtful and harmful, and there needs to be a lot more accountability. We often think of the child bully as being male, but the percentage of girls who intimidate their classmates and siblings is increasing dramatically. And as with boys, the abuse can be both physical or emotional. Bullying is traumatizing for kids who are the targets. In fact, I think children should be taught about bullying throughout grade school and into high school. They need to learn what it means, how to resolve it, and how to deal with a bully. If this is not taught, kids who are the targets will think there’s something wrong with them. Kids should also be learning how to handle their impulses and control themselves when they want to hit, hurt, or intimidate others. Unless there’s a concerted effort to deal with bullying and bullies in school, nothing will change. It’s a challenge, but I firmly believe it can be done. Thankfully, many schools have adopted bullying programs. But, I believe that bullying will never completely go away—we will always have bullies. The important thing is that we do not ignore it and that we hold bullies accountable for their behavior. I think from a very early age, you have to teach your child what bullying is. You can tell them the following (or even post these words in your house somewhere). This is not easy for kids, but they will learn. I really think children need to have the concept of bullying explained to them numerous times. That way, when any kind of bullying is going on, they can identify it and stop the behavior, both in themselves and others. I think the most important thing for every family is to have a Culture of Accountability in your home. This means your child is accountable to you—accountable in how he talks to you, how he talks to his siblings, and how he treats his family members. When he’s bullying his siblings, don’t get sucked into his excuses. Just because he had a bad day at school does not give him the right to mistreat anyone in your family, for example. Schools should also have a culture of accountability, and I think that many try. That’s what detentions, suspensions, and expulsions are all about. If your child breaks the rules, he should be held accountable. It’s very important that you let him deal with the natural consequences and not try to shield him from the consequences of his behaviors. Kids have got to learn how to manage their impulses. If their impulse is to hit or to hurt or call someone names, they have to learn to deal with that in an appropriate way. Many children and adolescents have the impulse to hurt others. They have impulses to do all kinds of things. But they need to learn to handle them, and kids who bully are no exception. Kids who are bullying others should be held accountable at home. They should absolutely be given consequences for their behavior. And the consequences should look something like this: your child should be deprived of doing something he or she likes. So, no TV or computer games or cell phone, for example. And they also should have to do a task. For example, they should write an essay or letter on what they’re going to do next time they’re in the same situation or feel the same way—instead of bullying. It’s critical that they start thinking of other ways they can solve this problem. Understand that they may not have any ideas, and that’s where you have to interact with them and coach them as a parent. 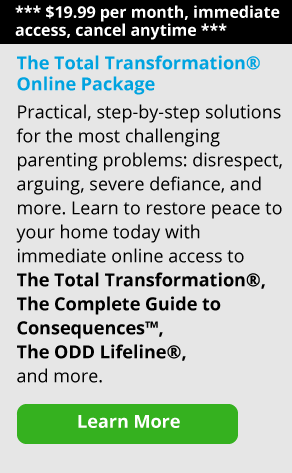 In the Total Transformation Program®, there’s an interview process I outline where parents learn to talk with their children to solve problems instead of exploring emotions and listening to excuses. If your child is hurting or bullying others, he needs to have conversations that solve problems. He does not need or benefit from conversations that explore emotions. Bullies tend to see themselves as victims, so the conversation has to focus on them taking responsibility for their behavior. I think your child’s teachers should handle the process of having your child make amends for his behavior at school. But remember that bullies don’t stop bullying when they get home—they often target younger or weaker siblings. Don’t forget, your child is bullying because solving problems by talking things out is difficult for him. So, he takes the easy way out and uses bullying. We all go through the growing pains of learning how to negotiate in social situations—in fact, we may work on this skill our whole lives. There should be no exceptions for anyone in your family when it comes to these skills. For a child who is using bullying as a shortcut instead of developing these skills, you have to work even harder as a parent to coach them on what to do. Make no mistake, if a child bullies, that tendency can stay with them their whole lives. Fortunately, some bullies do mature after they leave school. You’ll see them get into their early twenties and go their own way. They get married, they go to college, they start a career, and they stop their bullying behavior. But sadly, you will also see young child bullies who become teenage bullies and then adult bullies. How does this behavior and lack of social skills affect them? These are the people who abuse their wives and kids emotionally and sometimes physically. These are the people who call their spouses and kids names if they don’t do things the way they want them to. Bullies may also become criminals. Look at it this way: a bully is somebody who is willing to use aggression, verbal abuse, property destruction, or even violence to get his way. An anti-social personality disorder (which is how criminals are classified) refers to somebody who is willing to use aggression and violence to get his way. The criminal population is literally full of bullies who, among other things, never learned how to resolve conflicts and behave appropriately in social situations. If you think your child is bullying others, it’s very important to start working with him now. This behavior is already hurting his life—and will continue to do so if it’s left to fester. If you expect your child to outgrow bullying once he reaches adulthood, realize that you’re also taking the risk that he may not. And that choice may negatively affect him for the rest of his life.